Select the health percentage to eat at. This will eat when your health falls below this amount. Select whether or not you want to cast Reanimate Giant on the Ensouled Giant Heads that drop. Select how many casts of Reanimate you wish to bring. 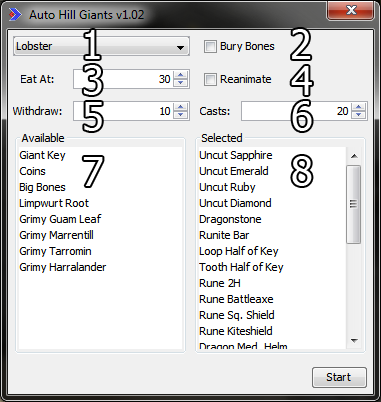 The list of available items that Hill Giants drop. You will not loot these items. Double-click an entry to move it to "Selected" (#8). The list of items that you want to loot. The Rare Drop Table is added by default, but you may remove it. Just started using the script now, seems great so far! Loot is the priority, so it will always loot what is available. Added nature, cosmic, and law runes to loot list. can you add the giant key to the loot table? I lowered the radius that it will grab loot from, from 15 tiles to 10 tiles. so, i hace to have like a lot of keys in bank??? or what?? No, you just need the 1. It doesn't pick up arrows? Run it in debug mode. Is it throwing an exception?